Millions of people across the country are expected to hit the roads for Memorial Day weekend. Here's some tips for Bostonians. Memorial Day weekend getaways are a great way to take advantage of that Monday off of work, but you don’t want spend your whole time headed to the beach or your family’s barbeque stuck in Boston traffic. AAA worked with INRIX, a transportation analytics company, to look at worst times to hit the road around Boston, so you, and everyone else, can avoid those and make the most of your plans. That’s the thing about this holiday — you certainly won’t be alone on the road. More than 41.5 million Americans are expected to travel for Memorial Day weekend getaways this year, the majority of which — about 36.6 million — will be doing so by car, according to AAA. The travel day in terms of Boston traffic is Thursday, May 24, according to AAA, specifically between 4:30 and 6:30 p.m. Since afternoon work commuters would be mixing on the roadways with those holiday travelers, leaving at this time means your trip could take nearly double (1.8 times) as long as usual due to traffic delays. Boston is also a top destination for Memorial Day weekend getaways, according to AAA, ranking at number 8 on the top 10 travel spots, so more people than usual could also be traveling into the city. MassDOT is advising drivers to take advantage of the department’s “real-time” tools, like downloading the GoTime app, visiting mass511.com, calling 511 and following @MassDOT on Twitter, to keep up-to-date with real-time traffic conditions before on I-90 and other roads, before heading out. The department also suggested drivers download Waze, a real-time navigation app, so you can keep an eye on Boston traffic once behind the wheel. 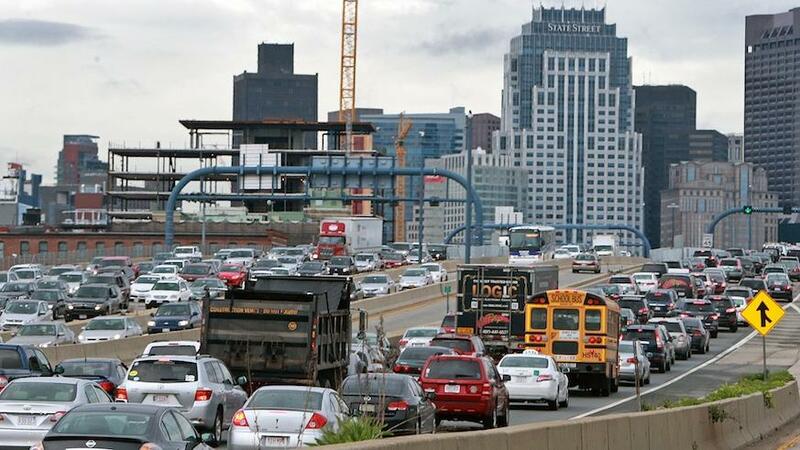 Thursday, May 24, I-93 southbound from Boston to Quincy from 2 p.m.to 8 p.m.
Friday, May 25, I-93 southbound from Boston to Quincy from 1 p.m.to 8 p.m.
On Memorial Day itself, Monday, May 28, the HOV lane will not be deployed at all, but MassDOT is providing another perk: To keep you fresh-eyed behind the wheel as you head back from your Memorial Day weekend getaways, 18 MassDOT service plazas will offer free coffee 10 p.m. Monday night through 5 a.m. Tuesday morning.